Chorley Chapter No 6287 installation meeting saw all three principals remaining in office for another year, but never the less was most enjoyable. The representative of the Grand Superintendent, Assistant to the Provincial Grand Principals Tony Hall, described the ceremony as being well worked and conducted with dignity. Pictured from left to right, are: Derek Whittle, Tony Hall, Simon Dally and Mick Matthews. Tony was accompanied by a Provincial delegation made up of David Coulson, Mike Greenhalgh and Barry Deardon along with Chorley Group Vice Chairman Peter Allen. The group’s secretary, Don Hesketh was also in attendance as he is also a member of the chapter. The first principal Simon Dalley opened the chapter and received the delegation with a warm welcome and thanked them all for attending. The chapter assistant director of ceremonies, John Bicknell then proclaimed Simon Dally as first principal, Derek Whittle as second principal and Mick Matthews as third principal for the ensuing year. The robe addresses were delivered perfectly and with sincerity by Don Hesketh with the red robe, Andrew Cogle the purple robe and finally Eric Kos with the blue robe address. The conclusion of the ceremony was the cue for Tony Hall to rise and give greetings from the Grand Superintendent Tony Harrison. He congratulated the three principals along with all of the officers wishing them good health for the coming year. Simon then presented Tony Hall with donations from the chapter of a total of £200. Tony in turn thanked the chapter for its generosity. The donation being split equally between St Cuthbert’s Hospice and Derian House, both charities local to the Chorley area. The chapter’s newest member Mark Briggs received his Grand Chapter certificate during the meeting which was explained perfectly by Tony along with a warm welcome into Royal Arch Freemasonry. As the chapter closed down John Eccles, a member of the chapter responded on behalf of the Provincial officers described the meeting as ‘short and sweet’ but never the less most enjoyable. The festive board was equally enjoyable with great food and hospitality that is always experienced at Chorley’s Cunliffe Hall. 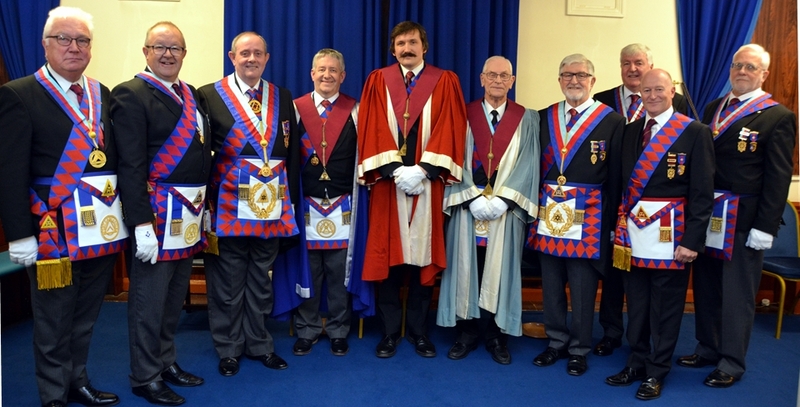 Chorley Chapter gave the companions the chance to hear the ‘questions and answers’ dialogue between Simon and his principal sojourner Peter Dawson leading up to the toast to the grand originals. This is a little piece done by some chapters at the festive board. Tony Hall in his response to the toasts added his personal congratulations to the chapter for a ceremony that, despite being simply a proclamation, was done very well. He thanked Eric Kos, the chapter secretary and John Bicknell for all the preparation work undertaken. 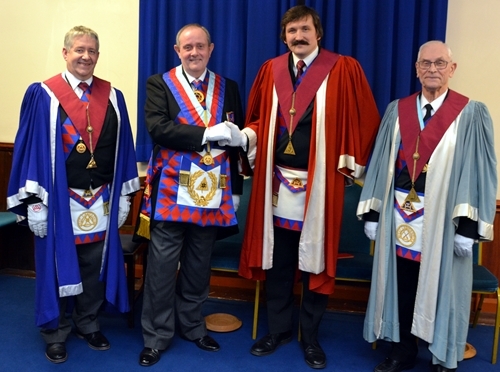 He pointed out that every member of the Royal Arch is in fact a membership officer for the order and everyone should be looking to recruit and encourage Craft Masons to take the all-important step. He mentioned that the Province has produced a ‘bullet point’ document to help explain various aspects of the Royal Arch which is readily available to all chapters. He also promoted the request to support the MCF during our current festival period. As the night drew to its conclusion, past first principal Chris Peters toasted the health of the three principals and Simon continued the short and sweet approach with his response. Pictured from left to right, are: Mike Greenhalgh, Don Hesketh, Tony Hall, Derek Whittle, Simon Dally, Mick Matthews, John Robson, Barry Dearden, Peter Allen and Dave Coulson. Story and pictures by Allan Shields.